“The red pearl of Morocco,” an Imperial city, and the country’s major tourist center, Marrakesh is situated at an important crossroads which once attracted merchants and traders from the Sahara, the High Atlas, the Anti Atlas, and the surrounding plains. 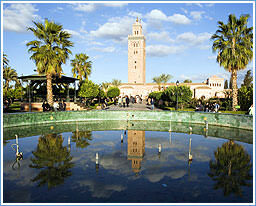 The city was founded in 1062 by the Almoravid sultan Youssef bin Tachfin. An amazing and vast palm grove with over 150,000 trees is located outside the city walls. 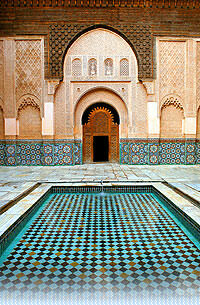 Meknes was founded in the 10th century by the Berber tribe, the Meknassa, and is also an Imperial city. 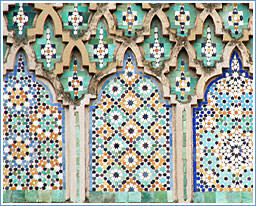 Many of its historic structures were the creation of legendary Alaouite sultan Moulay Ismail. The impressive Roman ruins of Volubilis are near by. A former French outpost and the gateway to the Sahara Desert, Ouarzazate—with its attractive crenellated towers and city walls—is also a base for several film companies. Many memorable movies have been filmed here: The Gladiator, the Four Feathers, Romancing the Stone, Cleopatra, Sheltering Sky, Jewel of the Nile, Alexander the Great, and Lawrence of Arabia. Founded in 1471 by descendants of the Prophet Mohammed, the city is one of the country’s prime examples of Moorish influence. Because it was considered impossible for a Christian to enter, only three Westerners visited prior to the arrival of Spanish troops in 1920. On the right, a typical street scene of Chefchaouen displaying the ornate iron grillwork and the distinctive blue hue of many of the buildings. A French military outpost stood on this site before the development of the city in 1930. Because Berber tribes had long resisted French rule, this was one of the last areas in Morocco to surrender to the French. Erfoud is especially known for its variety and abundance of dates and for the distinctive polished marble inlaid with fossils. 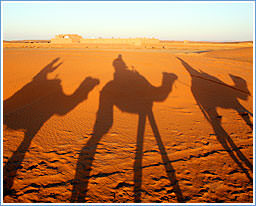 Excursions to Erg Chebbi, the eastern dunes which extend for almost twenty miles outside of Erfoud. The cultural and religious center of Morocco and the oldest of the imperial cities, Fes has been declared a World Heritage site by UNESCO. This city possesses the most interesting and distinctive medina (old town) in Morocco, which preserves the appearance and atmosphere of life in a medieval Islamic city. The walls and columns of the 14th century El-Attarine Medersa, right, display the wonder and intricacies of Moroccan design. The largest city in northern Africa, Casablanca was founded by the Phoenicians. Containing both traditional and modern elements, it is the country’s main center of commerce and industry and possesses Morocco’s largest pier. The city displays the influence of the French and particularly of Marshal Hubert Lyautey, the French General Governor in 1912who oversaw the city plan as we see it today. Rabat: The capital of Morocco since its independence in 1956, Rabat was developed by the French to replace the old imperial centers of Fes and Marrakesh. Sitting on the Atlantic Ocean, the city appears remarkably European but possesses some of Morocco’s oldest and finest historic monuments dating from the Almohad and Merenid Dynasties. The capital of Morocco since its independence in 1956, Rabat was developed by the French to replace the old imperial centers of Fes and Marrakesh. Sitting on the Atlantic Ocean, the city appears remarkably European but possesses some of Morocco’s oldest and finest historic monuments dating from the Almohad and Merenid Dynasties. 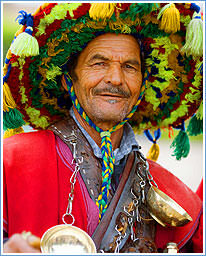 According to legend, Tangier was founded by Sophax, the son of Hercules. Artists and celebrities have always flocked to Tangier, and this city has hosted a varied community of expatriates and exiles, including Americans Paul Bowles, William Burroughs, Jack Kerouac, and Allen Ginsberg. Because the city was at one time an international zone and was a meeting point between Europe and Africa, it enjoys an atmosphere different from any other Moroccan city. 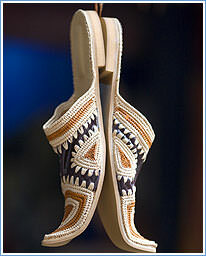 As a port, Tangier ranks second only to Casablanca. 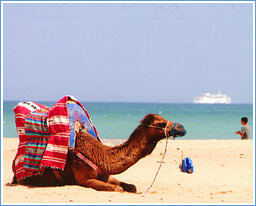 At left, a camel rests on one of the pristine beaches in Tangier as a cruise ship sails into port.